Friday, February 1st at 12:00 AM PT to Wednesday, February 6th at 11:59 PM PT. Ten (10) winners will receive a $50 Macy’s gift card. Users enter the giveaway by heading to the Macy’s page by clicking on the graphic above and submitting their email address on the form at the top of the page. The winners will be chosen through a lottery drawing and notified on Thursday (2/7) via the email address they used to enter. FREE TORY BURCH GIFT WITH PURCHASE OFFER! GET A FREE TORY BURCH GIFT WITH PURCHASE! No coupon code needed – Click HERE for offer! Here some great ideas for this Valentine’s Day! They all have special sales and deals! Read the article Valentine’s Day Gift Guide! Your new training gear is here. Meet your new studio workout companion: a sleek tight legging that fits like a second skin from Lululemon. Great for every season! vineyard vines updated their new Saltwater 1/2 Zip in a wrinkle- resistant, moisture-wicking fabric with plenty of stretch! Take 40% off sale until 1/9 with the code WHALE40! Get this bold and beautiful bypass ring for a steal during the Macy’s One Day Sale. Shipping is free after you spend $25 through 1/4! New year, new opportunities! Discover your #CourseToSuccess for 2019 with Coursera. Make your resolution a reality by becoming an ACE Certified Health Coach and save up to $250! Bring the best of Japan to customers all over the world with Akoya Pearl Jewelry. From January 7th (8 PM) through January 9th (7:59 PM EST) take $19 off orders over $190 at the Rakuten Global Market! Fun, fun, funnel! The depth of color on these brightly-dyed women’s Shep Shirts from vineyard vines pleases as much as their cozy warmth. Take 40% off sale until 1/9 with the code WHALE40! Beloved by thousands of women, SK-II has a rich 35-year history of bringing the miracle of crystal clear and glowing skin to women across Asia. From January 7th (8 PM) through January 9th (7:59 PM EST) take $19 off orders over $190 at the Rakuten Global Market! This Cole Haan Wrap Coat is elegant in its carefree, draped silhouette, and fastens only with a self-tie belt for closure. Get it during Macy’s One Day Sale through 1/5 and receive free shipping at $25. Make bold moves into the new year with pieces designed to support you in the pursuit of your goals. Lululemon designed this anti-stink long-sleeve layer with running (and sweating) in mind. Let this year be full of wonderful presents for you and your close ones! Celebrate 2019 with a unique 19% discount on Setapp gift cards, special for VigLink publishers through 1/31. Become an ACE Certified Personal Trainer and Save up to $200 for a limited time! 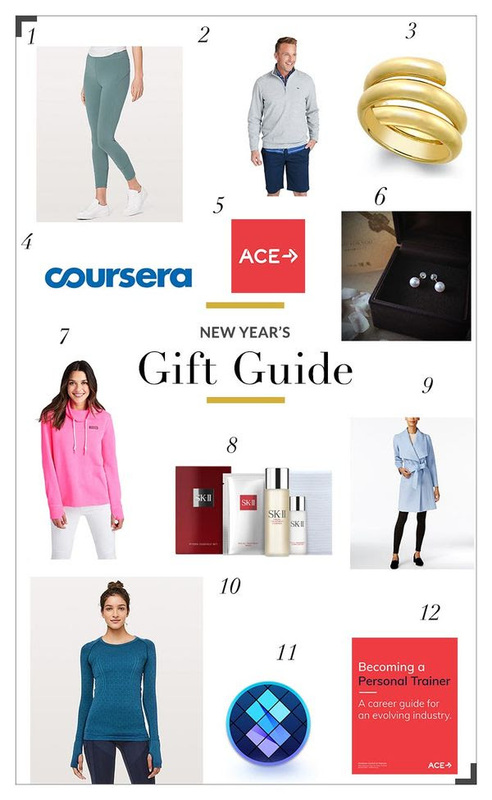 Read the article New Year’s Gift Guide!